Our family really likes muffins — specifically chocolate muffins with chocolate chips! Our kids also eat muffins fairly well — so while we almost always have pancakes and eggs or waffles and sausage for breakfast, it’s nice to have muffins on hand for days when we need an extra-quick breakfast (or a hearty morning snack). 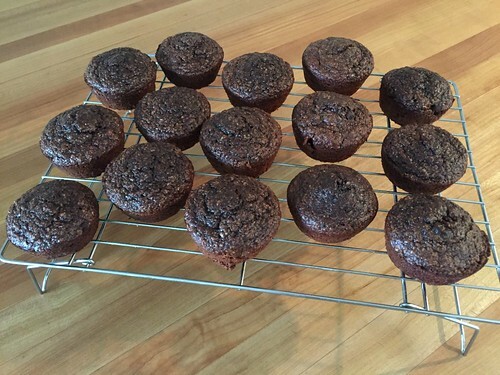 My favorite muffin is my chocolate chip banana muffins… Dave and the kids prefer straight chocolate muffins. And I’m fully aware that neither banana or chocolate muffins are extremely nutritious. Both have a lot of sugar, flour, and oil… and not much of anything else. Of course, I’m not opposed to eating sugar, flour, and oil, but I’ve found that when my kids eat a muffin, they don’t necessarily stay full very long. They burn off the carbs and sugar and are asking me for a snack again 30 minutes later. 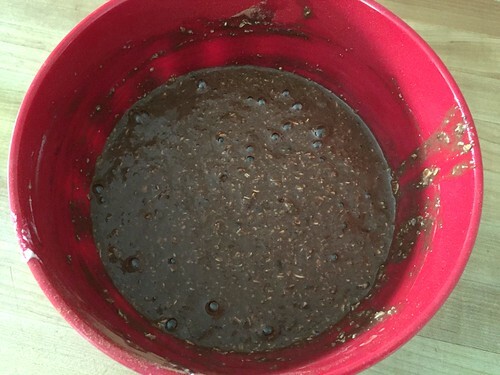 A couple months ago, I was telling a friend about my quest to find a chocolatey banana muffin recipe that was actually nutritious and could keep my kids full for longer than 30 minutes. I said the recipe had to be easy to make, use normal ingredients, and (of course) taste really good! 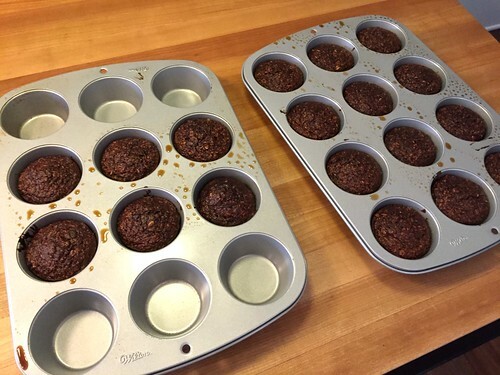 She said she had just the recipe for me — it was a recipe she had modified from a health food cookbook, and over the past couple of months I’ve made these high-protein muffins several times, tweaking the recipe each time. As you might notice in the ingredients below, they are all fairly “normal” ingredients I would assume most of you have in the house. The only oddball ingredient is oat flour. I actually use oat flour quite a bit in my baking — and I’ve never ever purchased it from the store. Oat flour is very easy to make — simply dump traditional oats into some sort of blender… and 10 seconds later, you have “oat flour”! I love the dense texture it creates when I bake with it — plus it’s more nutritious than all-purpose flour. If you don’t want to mess with the oat flour, just use my recipe for chocolate chip banana muffins. They won’t be “high protein” but they will still be delicious!! 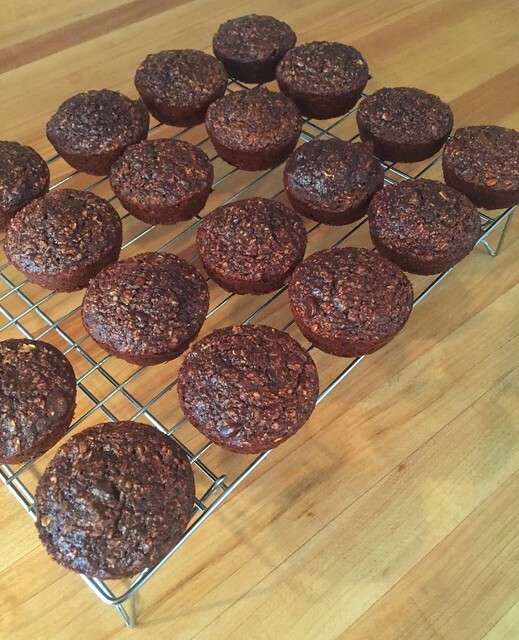 That said, if you’re looking for a really delicious, super easy, one-bowl muffin recipe that is also very high protein, very filling, and a fantastic way to use up overripe bananas… this recipe should work for you! **NOTE: I put all my “too brown to eat” bananas in the freezer, peeled and ready to go so I can just defrost a couple at a time for recipes like this. If you use defrosted bananas, they will be quite watery — that is just fine for this recipe and you can include any liquid along with the bananas. In a medium bowl, mash bananas. Add eggs, yogurt, vanilla, and sugar. Mix well with a fork. 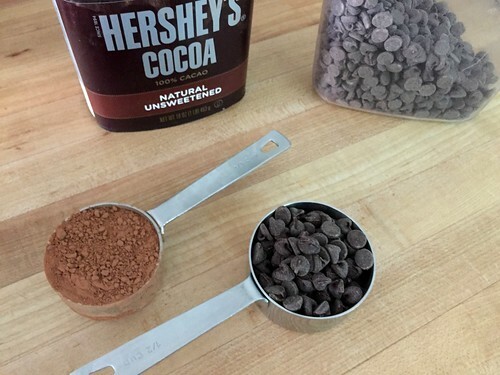 Add in oat flour, salt, baking powder, baking soda, and cocoa. Mix until combined. 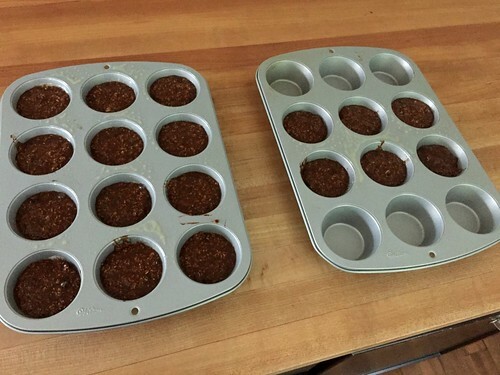 These high-protein muffins have been my go-to morning “first breakfast” or snack for the past couple of months… they keep me full all the way through lunch, they freeze well, and they taste fantastic. What are your favorite protein-packed snacks? Could the oat flour be substituted by oat bran? 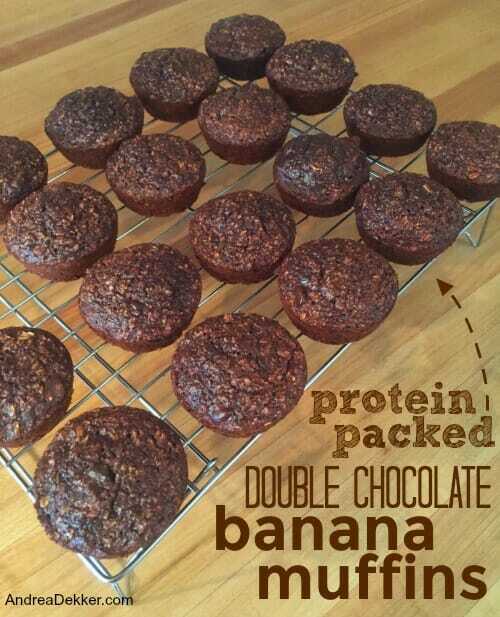 I love your original banana chocolate muffin so putting a healthy twist to it sounds amazing. I honestly have no idea, but you could always try a half batch to see if it turns out. And just an FYI, these really taste nothing like my other banana muffins — the texture and flavor is very different. Still delicious (in my opinion) but VERY different! These look delicious. I love oat muffins but one of my sons does not. Maybe the oat flour will be a good compromise. A time saving tip – I don’t thaw my frozen bananas. My mixer breaks them up just fine. I bet you he won’t even detect the oats if you grind it long enough! These look so good!!!! A trick I use for making breads or muffins and I want to sneak in some nuts ~ esp walnuts ~ is to grind them up until there are no chunks left and they are a flour consistency. this is such a good idea! I might just try it next time!! These look delicious! I will definitely be trying them out soon. You can up the protein even more by using Greek yogurt instead of regular. Yes! You’ll want to make sure it plain greek yogurt (not vanilla) otherwise there’s quite a bit of extra sugar and flavor from the yogurt in the muffins! These look great!! I’ve been wanting something like this for my hungry teen son and daughter…and my husband and I, thanks!! 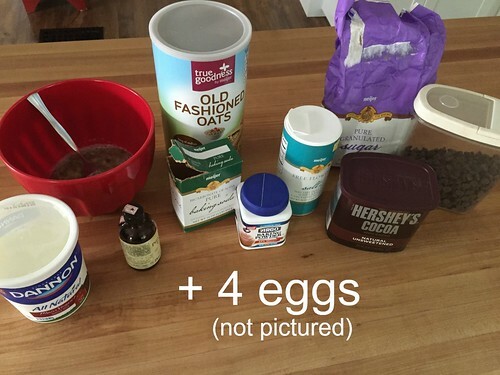 Ohh, I am pinning this to try when I get the ingredients! And they’re gluten free!!! If you add some walnuts, or your favorite nuts, you could significantly enhance protein content. Those muffins have “rich” taste of chocolate, and are without butter. I definitely don’t mind gluten, but somehow 2 cups of oatmeal instead of flour in this recipe makes me feel better when giving them to my kids. 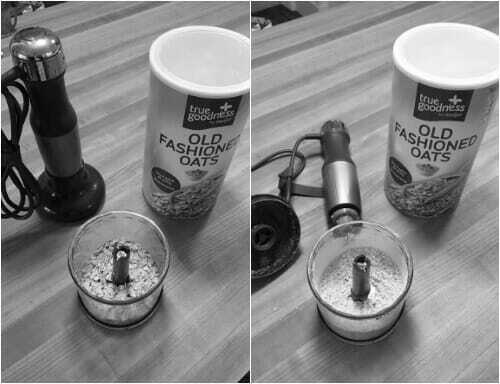 I also like to toast oatmeal a little, before grinding it. good point! I’m not a big nut person (at least not in muffins) and my kids wouldn’t touch these if they had nuts — but I didn’t think about the added protein. Thanks for the reminder! Thanks so much Angela — glad to have you reading! As for where I put all my baked goods, breads, etc. I made a spot for it all in my pantry (you can see a few older pictures of our pantry in this post). I guess if it were me, I would first choose a convenient spot in my kitchen to store the baked goods and bread. Once I decided on that location (cabinet above the stove, drawer next to the refrigerator, etc.) then I would figure out if I could purge or move whatever is currently in that space. It might take a little bit of time and moving things around, but if you’re willing to purge something from your kitchen (or even consolidate what you have) I’m pretty sure you can make a spot for your baked goods and bread. If worse comes to worse, find a couple nice-looking containers or baskets and keep your items “hidden in plain sight”! I’m excited to try these! Your banana chocolate chip muffins are DELICIOUS! My DH isn’t usually fond of muffins, but he likes those! Thank you! Thanks Ann — but just an FYI, these really taste nothing like my banana chocolate chip muffins. They are “heavier” and just have an over-all different flavor. Still delicious, just different!